Russia's scientific establishment made a decision to scrap the use of a brand-new spacecraft for most of its small instruments, including three missions already in development. The Space Council of the Academy of Sciences, which formulates the nation's space science program, deemed the Karat satellite too expensive. The light-weight spacecraft was designed to fly as a piggy-back with other satellites and serve as a low-cost platform for scientific experiments in orbit. 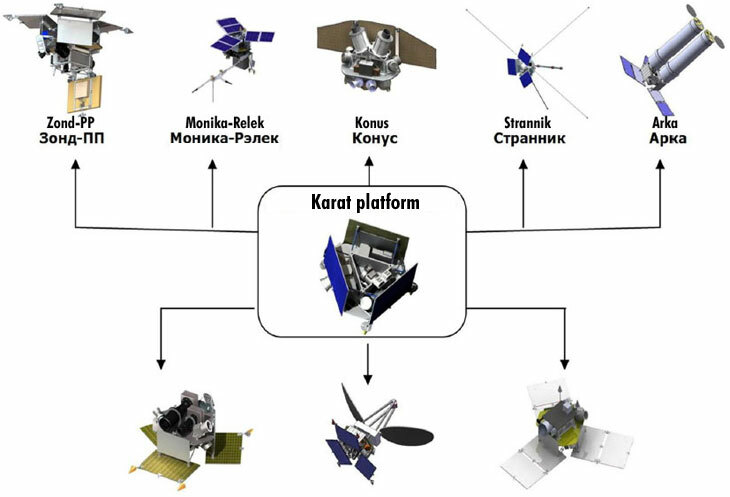 Above: A proposed family of science satellites based on the Karat platform. All but two first satellites (top left) were cancelled in 2014. At the beginning of the 21st century, engineers at NPO Lavochkin proposed a standardized small satellite bus, named Karat, which could serve as a basis for a variety of scientific missions. Karat was designed to have a dry mass of 100 kilograms and to be able to carry from 50 to 60 kilograms of payload. A pair of hydrazine tanks contained 45 kilograms of propellant for the attitude control system. Karat's solar panels were able to deliver maximum of 100 Watts of power to the payload. An S-Band radio-system could maintain contact with ground control at a range from 15,000 to 300,000 kilometers, depending on the antenna installed. Some design features of the Karat platform, particularly its flight control system, BKU, were apparently inherited from the ill-fated Solar Sail project developed during difficult years of the post-Soviet economic collapse. An initial federal contract for the development of what was officially identified as Small Spacecraft or MKA-FKI, was issued on April 27, 2006. Promised to fly as early as 2008, the first MKA-FKI/Karat-based payload finally reached the launch pad in 2012. 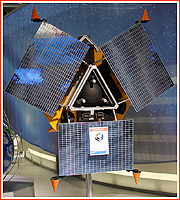 By that time, Russian space agency, Roskosmos, formally outlined the purpose of MKA-FKI satellites as fundamental space science research, including a flexible program of solar research, Sun-Earth interactions, the observation of the Earth and small bodies in the Solar System and astrophysics experiments. The flight control of the MKA-FKI missions would be conducted primarily with the use of existing ground assets. All MKA-FKI were expected to fly as secondary payloads on Soyuz-2/Fregat or Zenit-M/Fregat-SB rockets. Despite a successful launch of the first Karat satellite with a Zond-PP remote-sensing payload, the overall project turned out to be short-lived. According to industry sources, the Russian Academy of Sciences, RAN, which funded practically all payloads for the Karat platform, have concluded that the spacecraft was too expensive for its purposes. On March 14, 2014, the Space Council of the Academy of Sciences, officially rejected the use of the Karat platform for all but the Relek experiment, which was to be Karat's second mission. 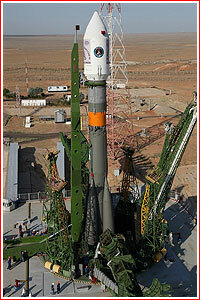 The third, the fourth and the fifth launches of Karat were all cancelled. 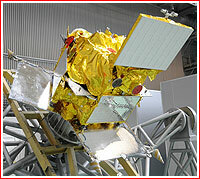 The fifth Karat was expected to carry the ARKA solar telescope, one of the few Russian-American space projects. The Space Council proposed to fold ARKA, as well as the Konus-M experiment from the third Karat mission and the Monika spectrometer (provisionally scheduled to fly on the sixth Karat mission) into the Koronas-K solar-research project. However all these experiments would have to be accommodated as secondary payloads onboard future Russian application satellites. The Space Council also recommended to conduct Strannik ("wonderer") experiments from the fourth Karat mission within the Rezonans project. Peculiarly, the Rezonans itself relied on the Karat platform, however, the Space Council gave its prime developer, NPO Lavochkin, three months to propose upgrades to the Karat platform, which would make it suitable for the latest requirements of the Rezonans project. As a small consolation, the Space Council directed the Pushkov Institute for Earth Magnetism, Ionosphere and Radio waves Propagation to evaluate the employment of the Karat platform for unspecified ionospheric studies. The Space Council also allowed to continue the development of the Monika instrument, to preserve considerable funds and efforts already spent on the project. However, the March 2014 decision, did not specified how or when the instrument would be launched. In development. Studies of large-scale turbulent plasma dynamics in near-Earth and deep-space environment. 2012 (327), 2014 (388) ?